Casters serve a necessary purpose in the day-to-day life of your facility. For transporting loads both large and small around your warehouse, you will need casters, but more specifically, the right kind of casters. Casters come in a wide range of capacities and materials that are suited to different flooring and surface types. Finding out which caster works best with which flooring type is the first step you need to take before making a final purchase. Luckily, the experts from S.W. Betz are here to help you discover more about caster types! Do I Need Light-Duty Casters? In some facilities, hauling around heavy loads is not the typical, everyday experience. Instead, the extent of the work that casters would be called upon to do in these facilities would be limited to lightweight loads and smaller jobs. In these cases, light-duty casters are the option to go with. Light-duty casters can come in polyolefin, thermoplastic, and rubber materials, and these different materials deal well with different flooring types. Stainless steel casters, for instance, can cope well with wet or corrosive environments. Do I Need Medium-Duty Casters? Medium-duty casters are capable of dealing with higher-weight capacities and a wider range of jobs. Like light-duty casters, they come in a range of materials, including semi-steel and aluminum, which make them exceptionally durable for a variety of flooring types. Do I Need Heavy-Duty Casters? Heavy-duty and extra heavy-duty casters are best suited to those facilities who require large loads to be transported with ease and safety. These casters are designed specifically to stay secure and stable no matter what, and so they can withstand many different flooring types and environments. 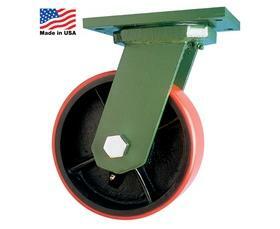 It is important to purchase high quality heavy-duty casters if your warehouse’s needs call for them. Do you have questions about the best caster type to choose for your facility? Get in touch with the experts from S.W. Betz today to talk more about your options. This entry was posted on Tuesday, January 6th, 2015 at 5:38 pm. Both comments and pings are currently closed.